Once the animals are removed from your structure we can help keep them out! Animals leave a mess behind. Feces and odors from their presence can draw more wildlife to the area. Although we ensure that the animals we remove will not make it back to your property, the point of entry will be there for the next animal unless it is properly sealed. Cleaning up the mess and properly animal proofing entry points is essential to keeping your structure pest–free in the future. We use quality materials in our unique animal and pest-proofing techniques to effectively seal out future problems. The owner of this home had dealt with birds nesting in the fascia for many years. After being unhappy with work done by someone else, they called us. The birds had already broken through previous repairs and started nesting. Our wildlife control team cleaned up the mess and made the repairs the way they should have been done to start with. Now you can’t tell that there was ever an issue! 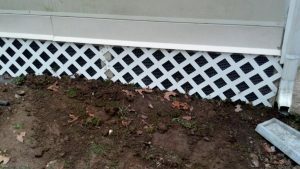 We pride ourselves in leaving your home looking as good or better than before we got there. Squirrels had squeezed their way into this home’s attic through the gable vent. While being up to standard for construction, the old screening just wasn’t strong enough to keep the squirrels out. Some wildlife companies and most carpenters would simply replace the torn screening with the same material. Animal proofing the vents required repairing the louvers and using a heavier wire screening. We also added trim boards to improve looks and add strength. Now it is strong enough to withstand the squirrels and raccoons, too! This is a common area to be utilized by animals entering homes and we have developed our own animal proofing methods to prevent future entry. Don’t fall victim to this preventable problem. Rather, contact our wildlife removal team for an inspection to see if your gable vents are vulnerable. If they are, we’ll give you a pest proofing estimate to protect your home from this problem. 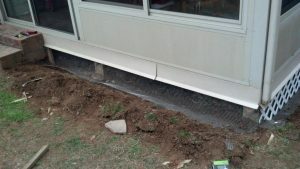 The screening being added to this low porch will prevent animals from ever nesting under it again. Many animals seek this type of shelter for protection from the elements and the safety from predators that it provides. Animal proofing areas like this can greatly reduce populations of nuisance animals around your home. We commonly see groundhogs, skunks, raccoon, opossum, feral cats and rats using these areas. This particular porch had become a popular place to be for over a dozen feral cats that a neighbor was feeding. We disinfected and deodorized the area under the porch and sealed it up. Now, this client can enjoy their sunroom again without the noises and odors associated with having animals living underfoot. If you are ready to exclude animals from your home using the most effective techniques, give our Top Rated Local® pest control and animal proofing team a call today. We proudly service homes and businesses in and around Powell and Knoxville, and will happily keep pests and wildlife from invading your home. 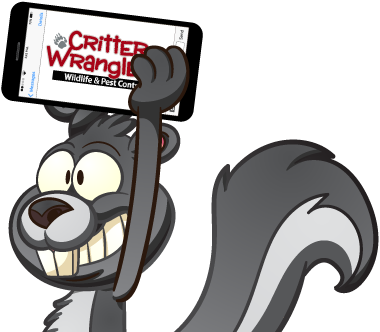 Give Critter Wranglers a call today or reach out to us online. Looking for high-quality pest control, rodent control, wildlife control, and more? Be sure to check out our pest and wildlife services such as animal trapping, attic restoration, and dead animal cleanup. Critter Wranglers wants to be your trusted full-service pest control company, so contact us today!